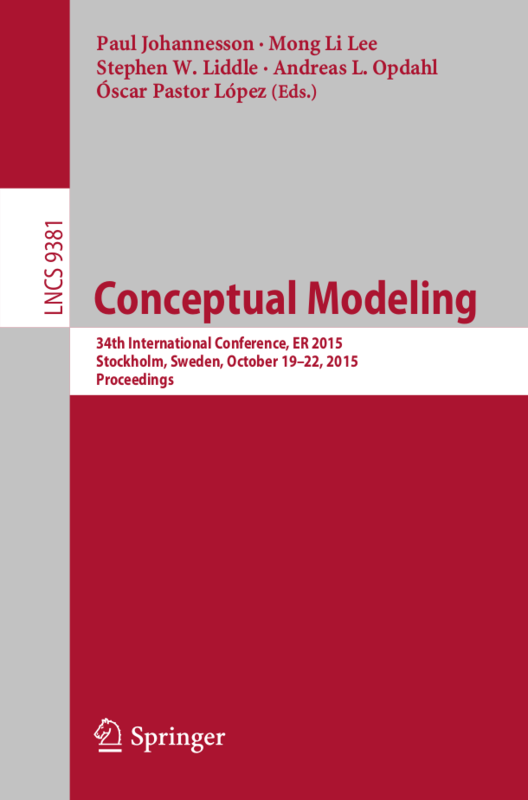 The International Conference on Conceptual Modeling is the leading international forum for presenting and discussing current research on conceptual modeling. The topics of interest span the entire spectrum of conceptual modeling including research and practice in areas such as: theories of concepts underlying conceptual modeling, methods and tools for developing and communicating conceptual models, techniques for transforming conceptual models into effective implementations, and the impact of conceptual modeling techniques on databases, business strategies and information systems development. We solicit submission of original research, as well as experience and vision papers, from both researchers and practitioners, welcoming any topic where conceptual modeling is a major theme. We specifically encourage submissions on the application and role of conceptual modeling techniques in new and emerging areas such as large data repositories for business intelligence, cloud computing and NoSQL databases. A paper submitted to ER 2015 may not be under review for any other conference or journal during the time it is being considered for ER 2015. Submitted papers must demonstrate to be aware of the state-of-the art literature in conceptual modeling by properly citing relevant papers in the field. Submission to ER 2015 will be electronically managed via EasyChair. Authors are asked to submit an abstract first, and then to upload the full paper. The submission page of ER-2015 is http://www.easychair.org/conferences/?conf=er2015. Best Paper Award: to be given to the best paper presented at the conference.